I have always been impressed with town halls. In many cases, a community pours its heart and soul into this building which often serves to characterize the city or town for eons. The architecture is often unusual and interesting in order to make the building stand out and be easily recognized. 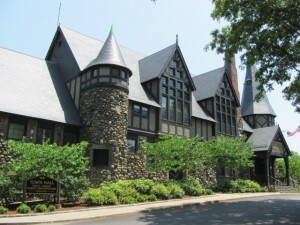 Town Halls are typically constructed of materials which are meant to last. Rhode Island is blessed with many lovely town halls, and these posts will highlight my favorites. 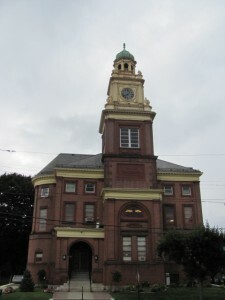 Come along and enjoy the Town Halls of Rhode Island. One wonders if Cumberland’s town hall was built by the same architect who designed the ones in Warren and Warwick since the appearance is strikingly similar. My favorite town hall in Rhode Island is the Barrington Town Hall. The field-stone building is positively charming and its prominent position, overlooking County Road, in ensemble with the town’s library, is picturesque and striking. 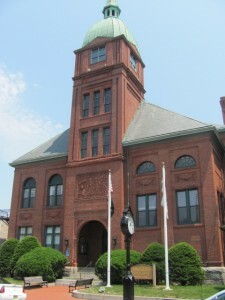 The town of Warren also has a distinctive town hall; it is more traditional with red brick instead of field-stone, but its tall tower certainly makes it stand out in a town with many, classic, old buildings.